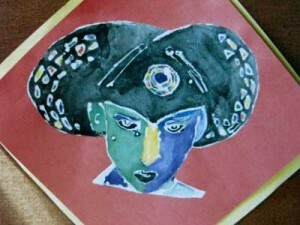 The therapy can be accessed in my Nottingham Art Therapy practice in West Bridgford. 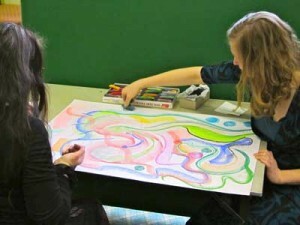 Art Psychotherapy is a form of psychotherapy that uses the art making process with applied psychology, psychotherapy and counselling techniques. It is particularly helpful for people who find it difficult to talk about their feelings and experiences, those who find it hard to remember past events and for those who would like to explore themselves, their relationships and experiences through visual as well as verbal means. It works well with individuals, parent and child together, and some couples find this approach useful too. Art Psychotherapy can be helpful in a range of problems relating to emotional and psychological distress. The relationships between therapist, client and image is central in helping you find out what is causing or underlying troubling thoughts, feelings, actions and symptoms. You will have an opportunity to think about your current situation and its possible links with past experiences, by exploring what is troubling you in depth with me. You will be able to explore your own experiences to find solutions in a safe and confidential relationship and setting. You can share parts of your life without fear of being judged or being told what to do and feel assured that any areas of difference you have will be respected. Beyond words On their own, words often cannot describe, explain or help you fully understand your life. 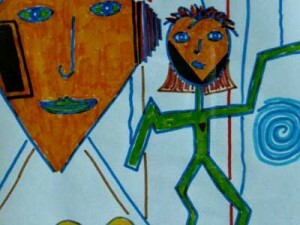 With therapeutic guidance and support, art can facilitate new understandings and insights about yourself, your relationships and situation, to resolve conflicts, solve problems and create new perceptions that in turn lead to new ways of thinking, feeling, relating to yourself and others and ultimately to live a more fulfilling life. Communication Both talking and art are powerful and effective ways to communicate for people of all ages and backgrounds, and I will listen carefully to all communications to help you find their meanings. Art materials including paper, paints, inks, pastels, crayons, felt tips, charcoal, clay and a range of craft materials are provided. You do not need drawing or painting skills or previous experience of art-making as the purpose of making art is expression and communication. Your finished art works will be kept safely in my care for the duration of your art psychotherapy in Nottingham. You can decide at the end of therapy what you would like to do with them. This approach can help you and your son or daughter spend time together, help you understand your child more and help your child understand themselves more. This can improve communication and build a better relationship, a closer bond, between you. Your child can also learn about their feelings and behaviour to gradually find better ways of dealings with these.